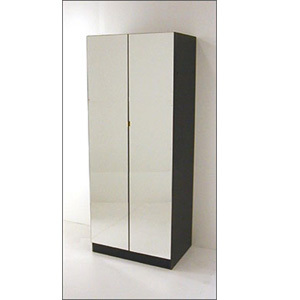 This Beautiful Wardrobe Features Top Hanging Bar And Full Mirror Front. Made of Melamine. Comes as shown with One Hanging Rod and One Top Shelf. This Wardrobe Is Available Custom Size. If You Would Like A Particular Size, Please Indicate The Shipping Comments Box While You Place Your Order Or Contact Us Via Email Or Telephone. *To See Colors Available Please Point At The Color Sample Picture Shown Left/Below. Wardrobe Is Shipped Fully Assembled.